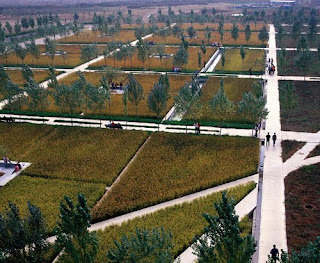 Landscape architects working in China must address issues of food production and sustainable land use, two of the biggest current issues on China’s horizon as the country moves towards modernization. The overwhelming urbanization process in China is inevitably encroaching upon a large portion of China’s arable lands. With a population of 1.3 billion people, but with only 18% arable land, China is in danger of using up one of its very valuable and limited resources. The concept of this design seeks to use rice, native plants and crops to keep the landscape productive while also fulfilling its new role as an environment for learning. It is designed to raise awareness of land and farming amongst college students who are leaving the land to become city dwellers. In addition, the designer also seeks to demonstrate how inexpensive and productive agricultural landscape can become, through careful design and management, usable space as well.